Norgen’s Magnetic Bead System: Magnetic beads bind DNA under optimized salt concentrations and release the bound DNA under low salt and slightly alkali conditions. This kit is designed for the rapid preparation of genomic DNA from various tissue samples, cultured cells, viruses, bodily fluids and swabs using a rapid spin column protocol. Purified DNA is of an excellent yield and quality, and is immediately ready for any downstream application including PCR, qPCR, genotyping, sequencing and more. The protocol can be completed in approximately 80 min (including incubation time). Norgen also offers a kit for sequential DNA, RNA and protein isolation from one sample (RNA/DNA/Protein Purification Plus Kit). This kit is designed for the isolation of genomic DNA from cultured cells, viruses and various tissue samples. For small inputs of cells and tissues, such as Laser-Captured Microdissection (LCM) samples, Norgen has designed the Cells and Tissue DNA Isolation Micro Kit. The genomic DNA is preferentially purified from other cellular proteinaceous component and is eluted into a small elution volume of 20–40 μl. Typical yields of genomic DNA will vary depending on the sample being processed. Preparation time for a single sample is approximately 60 minutes. 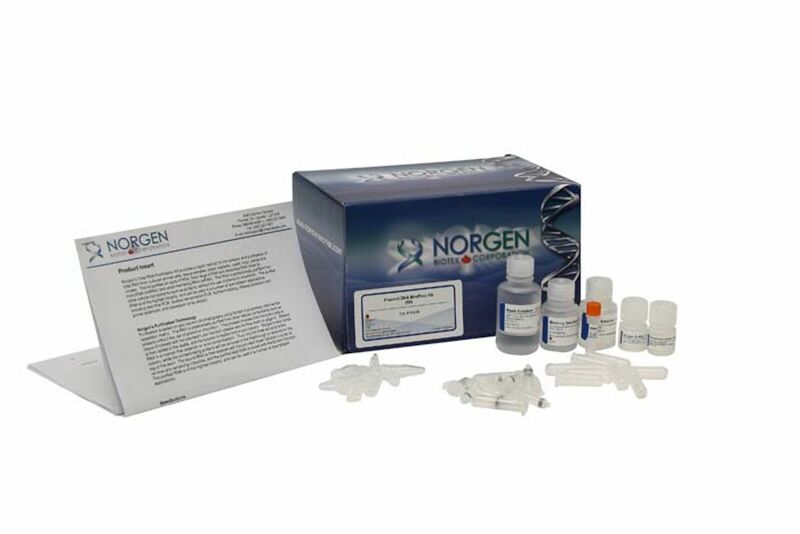 Norgen also offers a cell and tissue DNA purification kit based on the use of magnetic beads. This Cells and Tissue DNA Isolation Kit (Magnetic Bead System) provides a fast and reproducible method for purifying DNA of the highest quality which is compatible with a number of downstream research applications including PCR, NGS and microarray analysis. gDNA can be isolated from cultured cells as well as various tissue samples, cultured cells, bodily fluids and nasal or throat swabs. This kit is also available in a 96-well format for high throughput applications. This kit was developed to extract and purify DNA from formalin-fixed paraffin-embedded (FFPE) samples with a fast and easy processing using convenient spin-columns. The use of formalin in tissue fixation leads to crosslinking of the nucleic acids and proteins, and the process of embedding the tissue samples can also lead to fragmentation of the nucleic acids over time. Norgen’s FFPE DNA Purification Kit provides conditions that allow for the partial reversing of the formalin modifications, resulting in a high quality and yield of nucleic acids. The purified DNA is of high yield and integrity and is free of inhibitors, ready for use in a number of downstream applications including qPCR, mutation screening, microarray analysis, sequencing, SNP and STR genotyping. The protocol can be completed in as little as 1 hour. 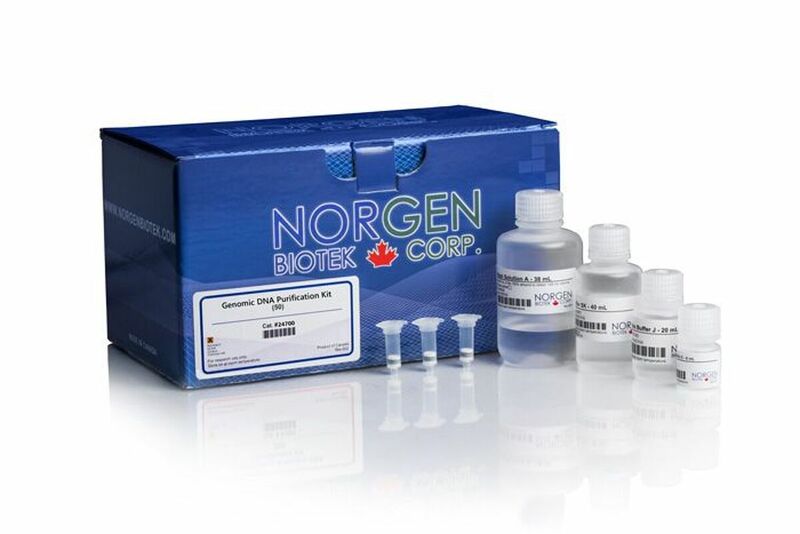 Norgen also offer a special kit for the sequential isolation and purification of total RNA and genomic DNA. Norgen’s Blood DNA Isolation Mini Kit is designed for the rapid preparation of DNA from up to 200 µL of whole blood using a rapid spin column protocol. For larger input volumes of whole blood, Norgen offers a Midi (0.3 to 2 ml) and a Maxi (3 to 10 ml) kit. Norgen also offers a Blood DNA Isolation Kit with Magnetic Bead System. This kit is designed for the rapid preparation of genomic DNA from up to 200 µl of whole blood from various species, incl. human, using magnetic beads as the separation matrix. Typical yields of genomic DNA will vary depending on the cell density of the blood sample. The purified genomic DNA is fully digestible with all restriction enzymes tested, and is completely compatible with downstream applications including real-time PCR, NGS and microarray analysis. For the isolation of genomic DNA from dried blood spots of anticoagulated and untreated blood, use the Dried Blood Spot DNA Isolation Kit. The purified DNA is of high quality, completely free from RNA contamination, and is completely compatible with downstream applications including PCR, qPCR and more. This kit rapidly and simply purifies all sizes of circulating DNA (cfc-DNA) from plasma and serum samples. The plasma/serum input volumes are very versatile, ranging from 10–200µl for the Micro Kit, 200–500 µl for the Mini Kit, 1–4ml for the Midi Kit, and 5–10ml for the Maxi Kit. The latter two kits for larger volumes purify and concentrate DNA using a convenient two column system. The Plasmid MiniPrep Kit is designed for the rapid preparation of plasmid DNA from small cultures of Escherichia coli using convenient spin columns. Norgen also offers a Plasmid MiniPrep Kit (Magnetic Bead System) designed for the rapid preparation and isolation of high quality plasmid DNA from small batch cultures of Escherichia coli using their magnetic bead matrix. The purified plasmids are fully digestible with all restriction enzymes tested, and are completely compatible with real-time PCR and NGS. This kit is also available in a 96-well format. The BAC DNA MiniPrep Kit is designed for the rapid preparation of BACs (bacterial artificial chromosomes) and other large DNA constructs from small batch cultures of Escherichia coli. Rapid alcohol precipitation or spin-column purification allows for the processing of multiple samples in 1 hour.​ Typical DNA recoveries range between 0.6 µg and 1 µg from 3.0 ml of bacterial cultures. The purified BAC DNA is fully digestible with all restriction enzymes tested, and is fully compatible with bacterial transformation and sequencing to achieve 95-100% accuracy. This kit quickly removes endotoxins from previously purified DNA. Norgen’s spin columns bind DNA while endotoxins, salts and other contaminants are washed away. The typical recovery of DNA is >90% of the starting sample. Three formats are available for different amounts of input DNA: Mini (25 µg), Midi (200 µg) and Maxi (1 mg). This kit quickly purifies amplified DNA products from PCR mixes using either spin-columns or 96-well plates for column chromatography. Can also be used as an alternative to organic extraction and ethanol precipitation to clean up various enzymatic reactions. The DNA Gel Extraction Kit quickly (<20 min) and easily extracts and purifies DNA from agarose gel fragments using spin columns. The recovered DNA is free from agarose and other impurities, and is compatible with restriction enzyme digestion, ligation into vectors and sequencing. This kit allows for high-throughput PCR amplicon clean-up and normalization of PCR product concentration (~5 ng/µl). Purification is based on 96-well column chromatography using Norgen’s proprietary resin as the separation matrix. The amount of Norgen’s matrix in each 96 well is optimized to have a limited binding capacity, thus each well can elute an equal concentration of PCR product. You can also find the whole list of available products in our shop.